The project MIMO – Moving In, Moving On! Application of Art-Based Methods to Social and Youth Work looks in the future – in the need for multiprofessional teamwork. Multiprofessional teamwork is seen as a new way of work, where youth workers and artists as well as social and health care professionals share expertise and bring together their strengths in everyday work with challenging youth. Moving In! 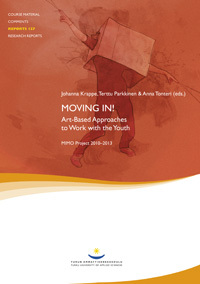 Art-Based Approaches to Work with the Youth is the first publication in the MIMO project series. It introduces viewpoints from different fields. The publication gives an overview on youth as a phase of development and reviews youth work and its objectives in Finland. It also offers insights to art-based methods that can be used with youth. The articles reflect upon the structural preconditions needed in the development of multiprofessional teamwork. The importance of dialogue and a reflective approach are emphasised in relation to sharing expertise and gaining common understanding. This publication can be used as teaching material at universities on degree and continuing education levels. It is targeted both at professionals and future professionals who work with youth or are interested in working with them. It is well suited for art, health, social and youth work professionals and others who wish to understand the starting points of these fields in multiprofessional work. The writers represent a variety of disciplines and have long professional experience as pedagogues and researchers.